The Carbonemys (car-BON-eh-miss,) often simply referred to as Turtle, is a species of creature in ARK: Survival Evolved. Carbonemys obibimus is one of the least aggressive creatures on the Island. Were it not for the plethora of predators on the Island, I'm quite certain that it would spend its days basking in the sun, eating, or sleeping. Carbonemys leads a simple, solitary life. Nevertheless, it seems to be one of the most peaceful animals I have yet encountered. With its slow walking speed, the only things that keep it safe are its surprisingly fast swim speed, and its incredibly thick shell, which can absorb tremendous damage. 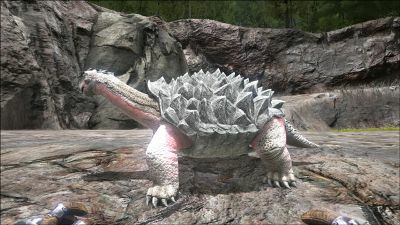 Carbonemys' swift swim rate, fairly high strength, superior shell defenses, and lack of real threat makes it an ideal armored mount for many survivors who shy away from violence. It can carry its rider to the ocean's resources at fairly high speed, and is not particularly dangerous to tame. Carbonemys is a neutral creature, and will fight back only if attacked or you take one of their eggs. They will also defend their own kind. Upon being attacked, Carbonemys can deliver quite a punishing attack, but nothing too fatal. Their extremely low movement speed allows them to be easily kited and killed for meat early on, however they have a very large amount of health, and require quite an amount of time to kill. Carbonemys are large turtles that often stand taller than a Human. Slow and usually placid, they are protected by one of the toughest shells on the island, in which they can draw back almost completely. The shell is armed with spiny scales. The skin of feet and tail is enhanced by firmer dander. Only the lower neck area is relatively tender. Their pine strips can be used as a cutting tool. They have small but alert and often piercing eyes, most commonly red. This section displays the Carbonemys's natural colors and regions. 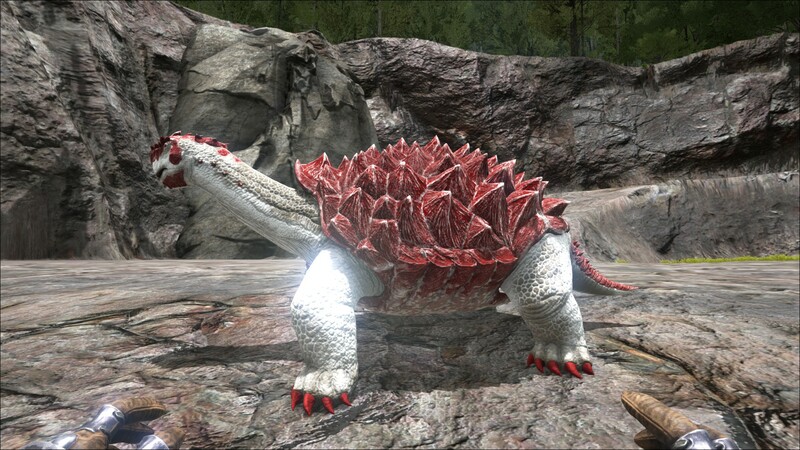 For demonstration, the regions below are colored red over an albino Carbonemys. The colored squares shown underneath each region's description are the colors that the Carbonemys will randomly spawn with to provide an overall range of its natural color scheme. Hover your cursor over a color to display its name and ID. For example, "cheat SetTargetDinoColor 0 6" would color the Carbonemys's "body" magenta. Using the (PC), (PS4), (Xbox One), the Carbonemys bites the target. It is not recommended that you get into a punching match with this spiky and very well-armored beast, you'll probably lose that fight. Instead you should look to a few other methods of knocking one out. The best method would be using a Scorpion and/or Tranquilizer Arrows, but if neither are available to you, then a simple Slingshot will do the trick. Aim at the head for best results and avoid hitting the shell as it has very little effect. Note: Weapons register hits from very slightly farther away than the creature will 'react' to. (i.e. it doesn't flinch or make a noise but the hit still deals damage). This section describes how to fight against the Carbonemys. The shell of the Carbonemys reduces incoming damage by 80%, the legs and tail by 50%, and the head only takes base damage (no headshot multiplier). The Carbonemys should not be attacked anywhere but the head due to the low damage on all other parts of its body. The Carbonemys is fairly easily killed with a Pike, Spear, or Ranged Weapons. Even though the Carbonemys can deliver a devastating blow to anyone with lower than Chitin Armor, this is easily avoided by backing away slowly and either stabbing or shooting the head of the animal. It is not recommended to use any close range weapons, such as a Metal Sword, due to the lack of distance between the player and the Carbonemys. If stuck in a tree or rock, one could easily lance hits into its face while maintaining a safe distance. Even if free from a stuck position, it is easy to kite/train(a gaming term that means to lead an enemy around in your control) to your advantage due to the horrendously slow movement speed. Any weapon with a longer range than a Metal Sword should do the trick, as the distance between the player and the Carbonemys will be large enough to avoid much damage. For lower levels, a Bow, Slingshot, or Spear should do the trick, and the same for those weapons' higher-level counterparts. New players should be aware that the Carbonemys is not simply a defenseless, lumbering turtle, but has a large pool of health and an efficient damage output. The creature can drag a fight out for a long time, exhausting any player that did not prepare themselves. Players with low melee damage and health may have a more difficult time taking on the Carbonemys. The Turtle's powerful jaws can deliver a devastating blow to low level players. 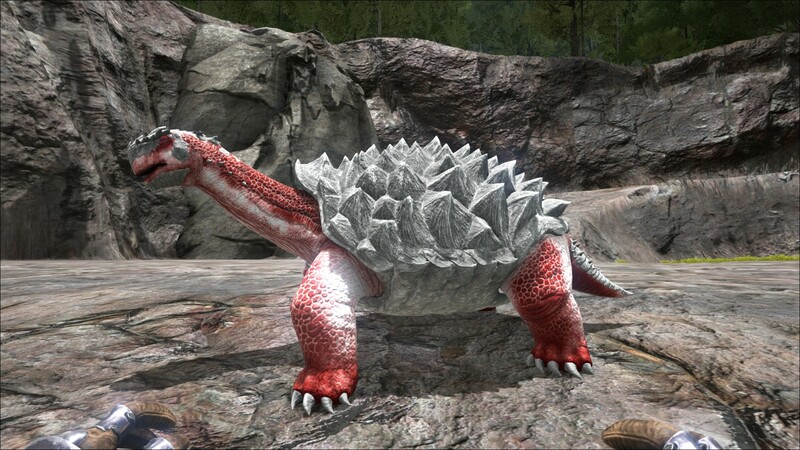 The Carbonemys is slow, and can easily be outrun on foot by the player and most creatures. It is easily led about and stabbed or shot, though it may take some time depending on the level to finally secure a kill. Carbonemys is Greek for "Coal Turtle". If you want to kill Carbonemys in the early levels (because they gain great amounts of Exp), use a slingshot to stun them. Be prepared with a medium quantity of stones. They can take a lot of hits before getting unconscious. After it, you are able to kill them without any problems. Make sure not to waste your spears for killing a stunned creature! It's possible that Carbonemys (like all extinct and living turtles) may not actually be true reptiles. This depends on if turtles are anapsids, which have no holes (temporal fenestra) in the sides of their skulls, or diapsids, which have two holes in the sides of their skulls like all true reptiles. This is a point of evolution heavily debated among evolutionary scientists and paleontologists. The real Carbonemys and Titanoboa were contemporaries. They both lived in the jungle rivers of what is now Colombia 60 million years ago. When mounted the player model grows to a VERY large size to "fit" the turtle's saddle, depending on the original player model, a player could double its size while mounted. The real Carbonemys was actually a giant species of side-neck turtle reaching the size of a small car. They were also believed to be carnivorous by scientists, using their beaks to crush bones, shells, and armour. In earlier versions of the game, it was possible to stand on a wild Carbonemys that was crossing a river to avoid getting bitten to death by Megapiranhas, as a bug caused Carbonemys to go unnoticed by them. Carbonemys are one of the few wild dinos that can be "ridden" by jumping on their backs.